Not even half way through the Whole30 experience and I'm already starting to think that I maybe should turn this into a Whole60! That's how good I feel. At least I know for sure, that after these 30 days, I won't eat dairy as often as I did before (like munching on whole chunks of cheese). I'm fine eating the way I eat right now and I'm sure I can keep eating like this for a long time. Maybe I'll use cheese, butter or cream more as an occasional treat instead of a daily habit. The same goes for stevia. Nearly two weeks in, I'm fine now with drinking my tea without a sweetener. I do love my Paleo coconut cake though, but I don't need to eat it every day, or even every week. Just as an occasional indulgence. And taken every now and then, stevia probably won't hurt me. It really amazes me how you can change your outlook on foods. Once I thought I couldn't live without bread. Now I'm living without it just fine. Three weeks ago I thought it would be really hard to give up my beloved cheese, but now I find that it's not that hard at all. Yesterday, I did however wanted a little sweetnes, so I decided to go for some fruit. Not really low carb, but I don't eat high sugar fruits daily. As a matter of fact, this was my first piece of fruit since starting Whole30. I paired it with sauerkraut. Plain sauerkraut is a little too...well, sour for me, so mixing it with something sweet seemed like a good idea. And it was. I also put in some curry powder. Lately I seem to use curry powder a lot. It's such an easy way to make stuff taste incredible in an instant. First I started by cutting the sauerkraut with scissors into smaller pieces, to make it more managable. I heated a tbsp of ghee in a large skillet and on low to medium heat I stirred in the sauerkraut. Not really frying it, more like warming. When hot, I added the curry powder and ginger powder and mixed it well. Finally, I tossed in the pineapple chunks and just warmed them through. 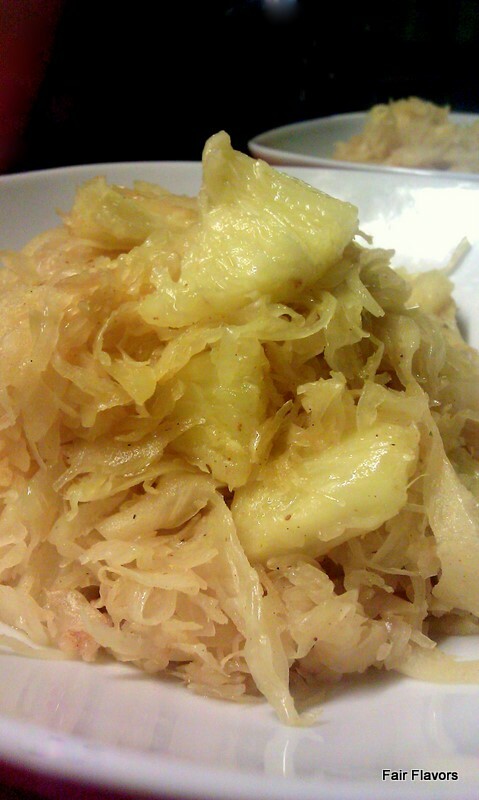 It seemed like a waste of nutrients to really cook the fruit and sauerkraut for too long. And that's it. It was really nice. Not "OMG, that's awesome" good, but it was a nice and different way of having sauerkraut. We ate this with (crapless) sausages. My take on good food, with real ingredients, without compromising on flavor! Whole30, day 14: Lunch in the sunshine! Copyright Fair Flavors 2011. If you wish to use content, please link back to this page. Simple theme. Theme images by gaffera. Powered by Blogger.